Two columns and a lot of consternation later, finally adding a post. Why is it every time I write a blog about our new house, I end up shelving it? To be honest, what’s the use? Talking about a mess doesn’t make it any better. Although, before I move on to the topic at hand, will gladly share a small snippet; it’s more than enough to sum up the current feelings about our new abode. (Btw, the decision has been made. We’re putting it on the market. Uncle.) The thrill is gone. The people next door, who haven’t even gotten in their house yet, said the same. Not long after they get in, they’re thinking seriously of selling it. Their assessment hit the builder’s nail on the head, the excitement of moving into their new home has been swallowed by the long and drawn-out heartache. Yup, that about sums it up. Took two weeks to get it fixed, but we are now sewage free. But, still no grass or driveway yet, and we’ve missed the spring rains. I reiterate, uncle. Luckily, there are better topics to spend time on, much better. For those of you who haven’t been with me that long, this time last year, wrote about an eventful week in Louisville, Kentucky, attending the Skills USA national competition. I’m back. Went into detail about the organization in that blog, but this go round has a different purpose; running with my recent theme of kindness being key. The reason I’m here, coaching and advising a group of students competing in technical fields for the title of National Champions. Helping several, but my specific group this year is a television news crew of four. Their collective wit and humor have made the trip most entertaining. And their talent is undeniable. They belong on the podium as far as I’m concerned. Every student in our group has chops. They all won gold medals in their respective fields at the state level; they belong in the national arena. The collective brainpower alone boggles my mind, then you throw in their extraordinary creativity and these gems are the cream of the crop. But beyond the particular skills that landed them in Louisville, their likability is their luster. You just want to hang out with them. One night of hanging out will be forever remembered; listed among most meaningful moments. There are two young ladies this year, who also attended the competition last year, Clare and Rachel. Together with their extraordinary teacher, Dave Hutchinson, we coached them to a silver medal in a graphic arts competition. They are national finalists, and in my opinion, should have taken gold. (A little biased.) We all got close last year, so having them on the team again this time has been a huge bonus. They’re special, they’re a cut above, natural born leaders; they are lion-hearted. Fiercely protective of everyone on the team, they take care of everyone else’s needs before their own. It’s who they are. And brave, they show no fear; of competition, of challenges, of people. But the trait that stands out the most for both of them, kindness. They offered a lesson in compassion I will never forget. 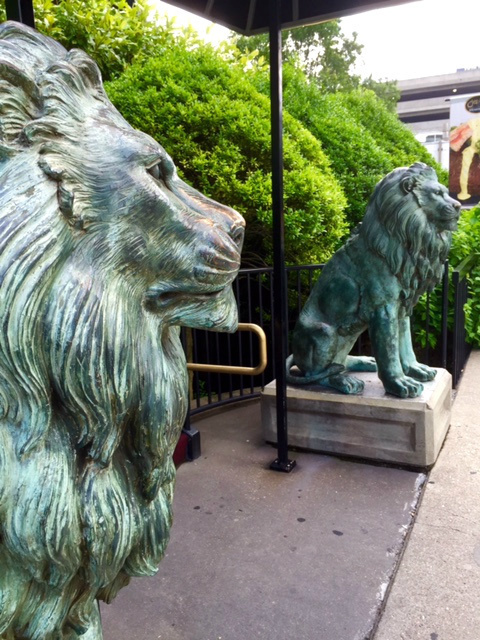 On this particular night, five of us had gone out to dinner; the two lions were among the group. A doggy bag, bursting with a combination of food from several plates, was collected at the end of the meal. Rach took out a pen before we left the restaurant and doodled on the Styrofoam container, (she’s a graphic artist, it's what they do.) She wrote, “Food 4 U”, I should have known what was coming. A little exposition is necessary. Unfortunately, over the last year, Louisville has developed a healthy homeless population. Didn’t notice it on our last trip, but this time around, there’s been a steady stream of people begging money and food. So sad. A cab driver told me they are mostly transplants from other areas. Louisville must be an easy mark. We hadn’t gone far on our trek back to the hotel when we encountered a man asking for money. As we proceeded to walk past, the girls stopped. They had food to give. I was digging in my purse for the constant flow of change that collects there, but they were ten steps ahead. Before I had a coin in hand, they had his in theirs. Introductions were being made, hands shaking, names shared. They offered kindness and dignity on a scale that transcends most adult interactions in such situations. I shook his hand, but have no recollection of his name; was too captivated by the poise and respect shown by the girls. They took an awkward moment and turned it into a pleasant conversation between strangers. It was an unexpected moment. Transformed by kindness. There was no beggar, there was a man, having a pleasant conversation with some people who were eager to share of their abundance. We had all eaten, and were full; they wanted to make sure he knew that comfort too. Their kindness was contagious. The golden rule in action. Walked away feeling like I had been a part of something rare and beautiful. Will never forget it. Lead the way, lion hearts, I will gladly follow.